Today’s post is to showcase a group of writings doing a wonderful thing. I met Chris through a forum and we buddies every since. It was through her that I came to learn about the group. You’re so welcome. Every bit helps especially if it’s for children. Chris told me about your wonderful group and wanted to help out. I keep telling her I will show up on the site but time has not been my own lately. Good luck. Happy Holidays, Sharon! Thank you for sharing your blog with the Peacock Writers, who have published every single book in the series in all three media ~ text print, illustrated print, and electronic. As a contributor who has published in all editions to date, I can truthfully say the experience of helping the group evolve and grow has turned me into a better writer. This group has a loving heart and soul. Members wholeheartedly support each other and each edition, designing them to bring hope and happiness to children across the world and gain support for various children’s charities. I can see you pour great heart into your writing too. Enjoy your handiwork too, for there is rarely a better companion than creativity. Hugs! Happy Holidays to you as well. When Chris told me about the group I wanted to do something to help, hence the blog post. I have been published in text print and electronic as well. I can’t say illustrated print since I don’t write in that genre. Best of luck to the group. Hugs! Merry Christmas, Sharon, and thank you so much for profiling our children’s charity books! I have contributed to the last two books and consider myself privileged to be included with this talented group of authors. Merry Christmas Lenora to you and the entire Peacock Writers group. What you guys do is just so wonderful. Best of luck. Merry Christmas Sharon and A Great New Year! 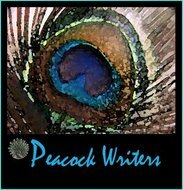 Thank you so very much for supporting the Blessings that are given by The Peacock Writers year after year. This year was my first experience with this wonder group of Authors and it has been a great pleasure to write along side them! Merry Christmas to you as well Linn. When Chris told me about your group it was so heart warming. I wanted to do something, even if it was small, to help out hence the post. Best of luck and well wishes to you and the group. Thanks for this. When you send all the proceeds (every last nickle) off to some deserving cause, it’s a bit tough to get ‘press.’ It seems much of the attention is focused on folks that pay for advertising in one way or another. Pay to be listed; pay to be mentioned; add ads… and so on. It makes what this blog does even more wonderful. THANK YOU from another Peacock. And, if it’s not too inappropriate to mention… you’ve really brightened my tailfeathers! It is just so awesome when others help spread the word! Thank you so much, Happy Holidays!